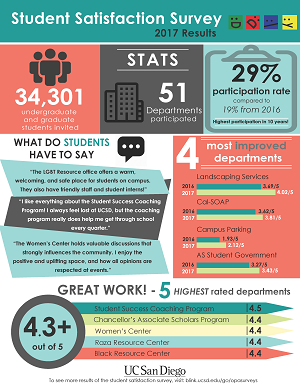 Thank you to everyone who participated in the 2019 Student Satisfaction Survey! Please check back in a few weeks for the survey results. The annual Student Satisfaction Survey has been used at UC San Diego since 1995, originally to provide key metrics to inform Balanced Scorecards for performance management in student business units in Business Affairs. Today, the survey includes 51 departments and units across 5 Vice Chancellor areas and is used by leaders to specifically understand the needs of their student customers. By measuring and taking action on feedback from student customer satisfaction, departments are supporting the UC San Diego Strategic Plan of creating an agile and sustainable infrastructure by ensuring dedication to a people and service oriented culture. Dowload the Student Satisfaction Survey infographic (PDF). The 2017 Student Satisfaction Survey period was January 11 through February 17, 2017. Housing, Dining, Hospitality - Culinary Services Convenience and student suggestions Expanded hours with first 24-hr location. Broad service window for the campus community. Expanded support for a number of Recreation programs for students living in campus housing. Programs include Student Personal Wellness, Outback Adventures, and Fitlife Mobile programs. Provided wellness programs to hundreds of students living in campus housing. Continue construction of Mesa Nueva Single Grad/Prof student housing project with first move-ins scheduled fo 8/1/2017. Congratulations to our lucky winners from 2017!